Name tags have come a long way since I was at school. Last year when my nephew started reception, we got him some name tapes from ‘My Nametags’ and he absolutely loved them. He “designed” them himself, choosing the font alongside a picture to go next to his name on a patterned background. It all helped to get him excited for starting school. I had never seen name tapes as lovely as these before- mine were very plain when I had them. I love when practical things get a jazzy makeover! Once they arrived, they looked great and I made a mental note to order some for my daughter when nursery time came. And now, rather quicker than I would have liked, it’s nearly nursery time. I have been told by many friends with children at nursery that it’s the place where clothing and other items disappear and/or become paint covered tattered shreds. I have taken two main points away from the advice I have been given. The first is to send them in older/cheaper clothing and the second is to label everything. With this in mind, I needed name tags that would be suitable for clothing and also things like her bag and sippy cup as well as shoes and comforter. And even though they are a necessity, I wanted them to look nice. Luckily,‘My Name Tags’ have tags for everything! They have stick on and iron on tapes in both colour and black and white. And they have a huge range of colours and designs to choose from! For the majority of her clothing, I chose some black and white iron on name tags with a little panda on them. 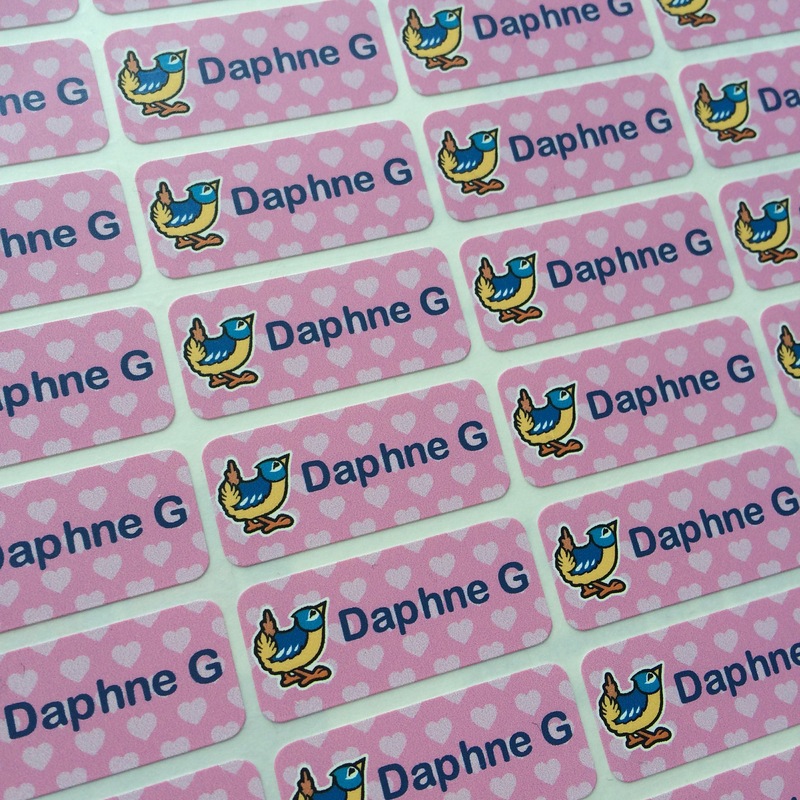 These look like traditional nametags but with the addition of a cute motif of your choice from a large selection. Very simple yet cute. These tags came in a pack of 120 with very clear instructions printed on the back of the packet of how to apply. This is ideal if, like me, you tend to ‘misplace’ instructions 5 minutes after opening anything! For everything else, I got a pack of colour stickers. I had quite a nice time choosing which designs to have- I can see why my nephew enjoyed it so much! In the end I chose a perky little bird on a pink hearts background. The colour stickers are dishwasher and microwave safe so will be perfect for her cup and bottles. They can also be applied to the inside of shoes and wellies which is great. They look lovely, don’t they? The print is pretty and bright and I like how they look a little different from your average name tags. I attached one to a comforter label and ran it through the wash and as you can see, it looked like it had been freshly applied even after a spin in the dryer! I paid for the products mentioned. I’m impressed with the quality and wanted to share a great product! They also ship very quickly! Name tags are great, especially when your kids at school. I use them for all of my sons school stuff now as so much goes missing! Great review. We’ve been using these all year – I used the stickers on their clothes and they’ve been fantastic. So much easier than ironing or sewing that’s for sure. Ah we reviewed these last summer and loved them then (for the designs, ease of use) and love them now for how long they have stayed in place! And my daughter knows that her cardigan (etc) is the one with the Hello Kitty label in without even having to read her name. I’ll be ordered more for the next school year and also some for my 2 year old who is off to play school! We’ve had these and they are brilliant, they’re fantastic on water bottles in the dishwasher. I’d not go back to the ones you have to sew on now.